Like precious nectar, this truffle oil is made with an excellent Italian extra virgin olive oil perfumed by the white truffle smell! Just amazing! Extra virgin olive oil, white truffle (tuber magnatum pico). 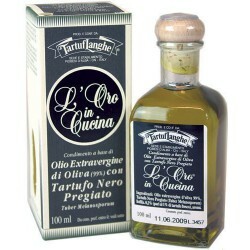 I love to use this white truffle oil on a piece of toasted bread with a pinch of white truffle salt.